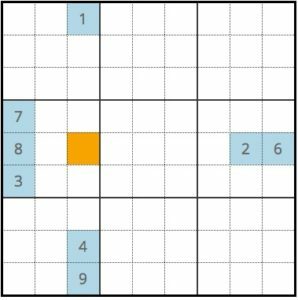 A naked single occurs on a sudoku board when every other number has been taken for a cell. Looking in the row, column, and box occupied by the cell, you will see that there is only 1 possibility left. When this happens, it means that cell can be filled in with the missing number. The cell highlighted in orange can only be the number 5. Every other number has been used in the row, column, and box. When visually scanning the possible numbers that can be placed in a particular cell, sometimes it helps to count in your head. Look at the 20 cells that share a row, column, or box with that cell. Then in your head, count to 9. If there is only one number missing, you have found your hidden single. When using pencil marks, naked singles are very obvious. There is only one pencil mark left.